The Electric Road Trip | One summer, 50 states in a Tesla with my dog. Join us! Iceman the dog and my Tesla have now been on the mainland for a month, ready to launch this road trip. The problem? Life happens! 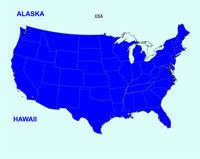 A pressing issue brought me back to Hawaii for several weeks. During that time, I kept thinking of the marvelous feeling of the open road, a spirited car to drive, and my best friend snoozing in the back seat. I can almost smell the pines on a cool morning drive through the mountains. Can’t do your own road trip this summer? No worries, please join Iceman and I on this trip via this blog! What’s this? My Tesla is getting serious about breaking us free from our bout of Island Fever. The Model S 70D and my dog Iceman were set to depart for LAX on Pacific Air Cargo while I rushed over to Hawaiian Airlines to catch a flight to Los Angeles and see if we could all get together that night. My concerns about whether the car would make it onboard the 747 evaporated when my friend Vic, a freight pilot, happened by and sent this shot to me via smartphone. The trip is on! Iceman the dog and I are diagnosed with a bad case of island fever. Remedy underway. Please see video. More to come soon. This winter Iceman and I chose to remain in Hawaii. As Christmas approached, the big question was: has Iceman been naughty or nice this year? Several times this year, Iceman thinned out the tourist population on Kailua Beach through his various efforts as shark dog. This behavior definitely fits in the category “naughty”. On the other hand, he’s been a terrific companion, and the nice balanced out enough so that when Santa arrived this year, he came to Kailua aboard a surfboard, guided over the reefs and to a soft landing in the sand by none other than Iceman. A recent article on Bloomberg, I Went Camping in the Trunk of a $145,000 Tesla, highlights the vehicle’s hidden attribute of serving not only as a sports and luxury car, but also as a camper. Author Tom Randall did a great job of laying out an alternate method of keeping the car’s ventilation system running all night, should you choose to catch your Zs in the vehicle. During my road trip last summer with Iceman, we found ourselves a couple times in a situation where neither dog-friendly motel nor camping spot was readily available. What to do? Model S camper mode to the rescue, of course! The true aficionados of sleeping in a Model S will use some cardboard to even out the floor after the back seat is folded down, place an inflatable pad upon the sleeping area, break out pillow and sheets, and snooze away in a surprisingly comfortable sleeping area. My nocturnal slumbers took place in the driver’s seat, folded way back like on one of those ritzy first-class seats for flying across the ocean, but the Tesla bed would no doubt have been more comfortable. 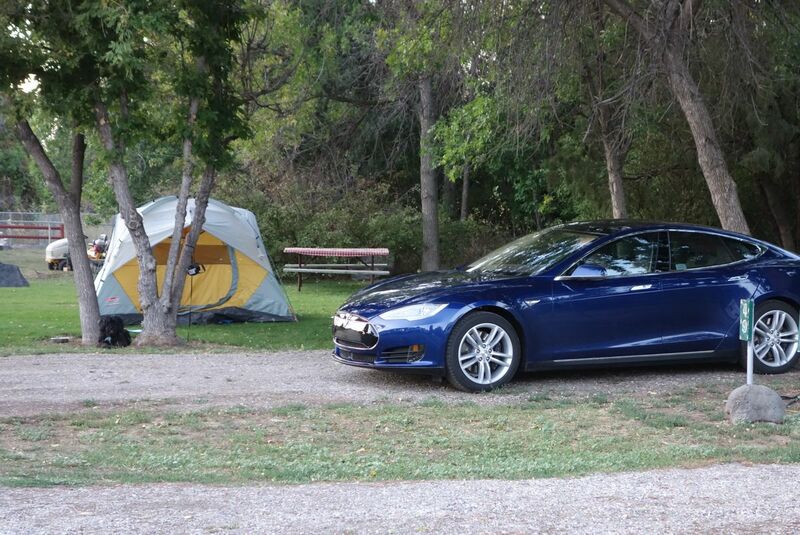 Twice during camping sessions I chose to abandon my tent and sleep in the Tesla: once when a mighty thunderstorm rumbled through, and once at a campground where the other campers just wouldn’t quiet down. Inside the Tesla, neither electricity being thrown down by Zeus nor chatty campers could disturb my tranquility, and I even requested a few favorite songs via Slacker to ease the transition into total relaxation. Fifty-state pioneer Michael Fritts has even created a tent that fits perfectly when his Model S’s hatch is open. Check it out. So, might I abandon the tent in favor of snoozing in the back of the Tesla on my next grand road trip through America? Yeah, I just might. The time spent in setting up camp and breaking camp eats up an hour on each end. Those two hours a day could be better used for so many other things. In bear country, I’d sleep more soundly within my aluminum cocoon than in a nylon tent. Way up north, beyond the superchargers, lies a world of 6 hour charging sessions to bring a battery full again. Previously, I charged overnight and then wasted many hours with a long helper charge mid-day. Instead, I could charge and sleep for 6 hours, hit the road, and repeat in order to substantially up my daily mileage, should I feel inclined. The lure of adventure is a powerful thing, and I could see this blue Model S making its way back to the mainland some day in the future. After all, there’s a road here and there that my dog and I haven’t seen yet. We know that some crazy drivers have gotten Teslas airborne, but that’s not what I’m talking about. How about thousands of miles covered at a time? Here’s photographic proof that Teslas can indeed fly! All it needed was a little help from a Pacific Air Cargo Boeing 747. My 70D arrived in Honolulu today, May 10, on my birthday. Once I drove it out of the air cargo hangar it officially became a 50-state Tesla.